While celebrating its 45th anniversary, Spain’s multi-award-winning La Manga Club is determined to remain at the forefront of European golf well into the next decade and beyond. The five-star resort is completing a three-phase upgrade of its golf offering and will be finalising refurbishments to the tees on both the North and South courses, with improved access, landscaping and stone-work. In addition, by the time the season gets fully underway, the resort will have replaced around 75 per cent of its groundskeeping equipment, upgrading to the latest available Toro machinery. Meanwhile, on the West course, a huge project is underway to improve the pathways for smoother and easier movement around the course. This will complete a project implemented by director of golf Eduardo Ruiz, who joined La Manga Club nearly three years ago, and golfers have already enjoyed the benefit of a refurbishment of the club shop, locker rooms, Bar 37 and course furniture. Ruiz explained: “Throughout the project, we have continued to purchase machinery, condition the tee areas located close to the hotel, and landscape the pathway from theclubhouse to the hotel. We’ve put the terrace in the clubhouse into action and we will soon complete our biggest task: improving the buggy pathways on the West Course. The 566-hectare resort continues to rack up the accolades, with 2018 already seeing La Manga Club hailed as Spain’s best golf resort in the Today’s Golfer Travel Awards, for an amazing seventh successive year. And, in the recently launched Top 100 Golf Courses website 2018 ranking, it retained its position as Spain’s number one golfing venue, with all three courses featuring inside the top 35 – the only resort in the country to receive such an honour. These latest endorsements come shortly after La Manga Club was also named ‘Europe’s Best Golf Venue’ at the 2017 World Golf Awards. 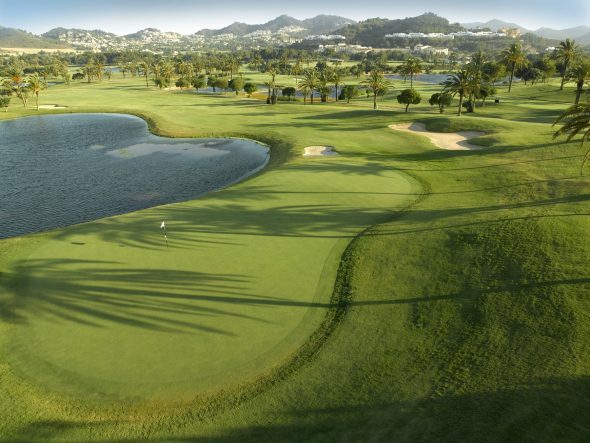 Three times the size of Monaco and nestling in an exclusive corner of Murcia in south-east Spain, La Manga Club has been at the forefront of European golf since opening in 1972, with its other facilities including a nine-hole academy course and outstanding practice facilities. The official overseas training base of the Lawn Tennis Association (LTA), the resort’s unrivalled amenities also include a 28-court tennis centre, a new European Cricket Performance Centre and a 2,000sqm Wellness Centre. In addition, it features the choice of a five-star hotel, four-star serviced apartments and townhouses and more than 15 bars and restaurants.